Electrical Discharge Machining (EDM) is a widespread technique used in manufacturing industry for high precision machining of all types of conductive materials such as metals and its alloys of any hardness which are difficult to machine with traditional techniques. EDM process find application in various fields such as the automotive, medical, aerospace, electrical and electronic industries. EDM uses two oppositely charged electrodes namely a machining electrode and a work-piece, and then bring these electrodes closer in dielectric fluid. As the electrodes get close enough, insulation breaks down and a spark will occur, resulting temperature to reach about 12000 degrees Celsius which will melt and vaporize the material. The discharges that reveal the “spark” create the crater-like surface by removing the material. 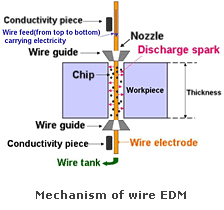 The electrode and work-piece never touch each other, and a small gap is maintained at all times. The electrical discharge machining proceeds through repetition of the above phenomenon tens to hundreds of thousand times a second. Importantly there are few parameters need to consider in EDM are material removal rate, accuracy and surface finish. The colour degradation, change in micro hardness and heat affected zone of the material after the EDM are also important for the majority of the EDM applications. 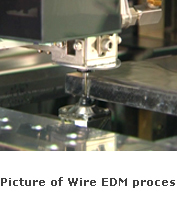 Basically there are two types, namely die-sinking EDM and wire-cut EDM. 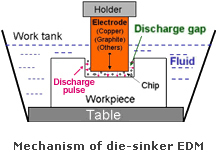 Die-sinking EDM is a non-traditional manufacturing process and will be used for making negative impression of the electrode on the work-piece. 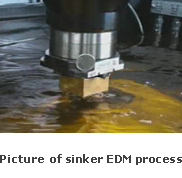 The machining will done in the dielectric submerged condition. Generally machining electrode will be of Copper and Graphite and work-piece will be of any conductive material and their alloys. Today’s most of the die-sinking EDM applications require multiple passes to get the desired accuracy and surface finish on the machined parts. This is done by applying different combination of machining parameters like current, voltage, discharge on/off time etc. which are automatically precisely controlled by computer with the help of preset conditions database. In Wire-cut EDM, a moving thin wire will be used as machining electrode and deionised water as dielectric fluid, the conductive material will be cut using thin wire which follows the programmed path. Even for Wire-cut EDM, most of their applications require multiple passes of the wire to get the desired accuracy and surface finish on the machined parts. This is done by applying different combination of machining parameters like current, voltage, discharge on/off time etc. which are automatically precisely controlled by computer with the help of preset conditions database.